I've been submerging myself into fall. We carved pumpkins (mine was the witch); I've been eating farmer's market apples; I have even been cooking cool-weather inspired foods like Maple Glazed Acorn Squash, Whipped Sweet Potatoes, and Homemade Roast Beef. I think I've just about had my fall fill and am almost ready move onto Thanksgiving planning and Christmas decorating. Now, back to fall and the Culinary Smackdown. 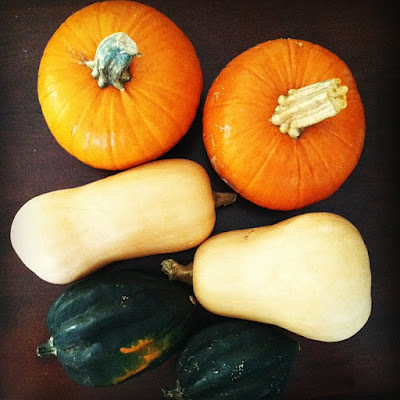 This months theme--chosen by me--is Battle Winter Squash. I decided to use some butternut squash that we grew in our garden this year to join in on the fun. I've been holding onto our homegrown squash for several months trying to figure out what to do with it. I wanted it to be something sort of special and it was also important to me to that the squash be the main ingredient. I decided to go with a Butternut Squash Gratin. The caramelized onions combined with the soft butternut squash created a slightly sweet and creamy filling. The crumb topping (which I made with gluten free bread and fresh rosemary and thyme) was crunchy and aromatic. The original recipe called for adding cheese to the topping but I'm glad I omitted it. Instead, I drizzled a few tablespoons of olive oil over the bread crumbs to help them brown in the oven. Trust me--skip the cheese. This recipe can be easily adapted to work with whatever is plentiful at the farmer's market this fall. If you think this sounds (and looks!) 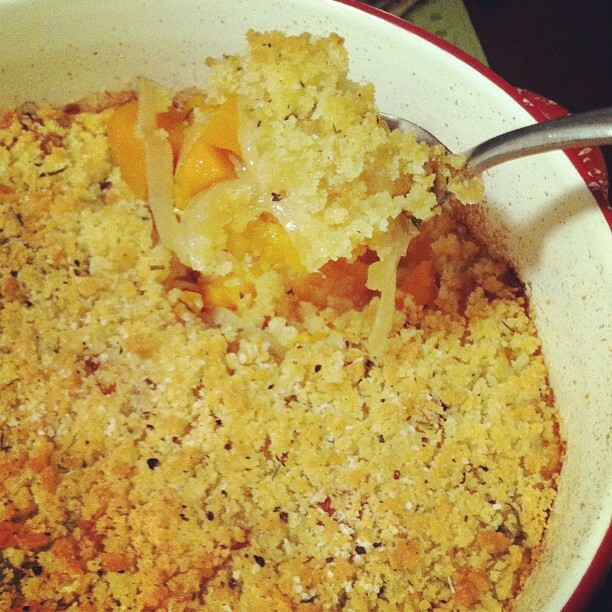 good, how does squash and parsnips sound with a sage crumb topping? I hope your entries are good--because I think I set the bar high! 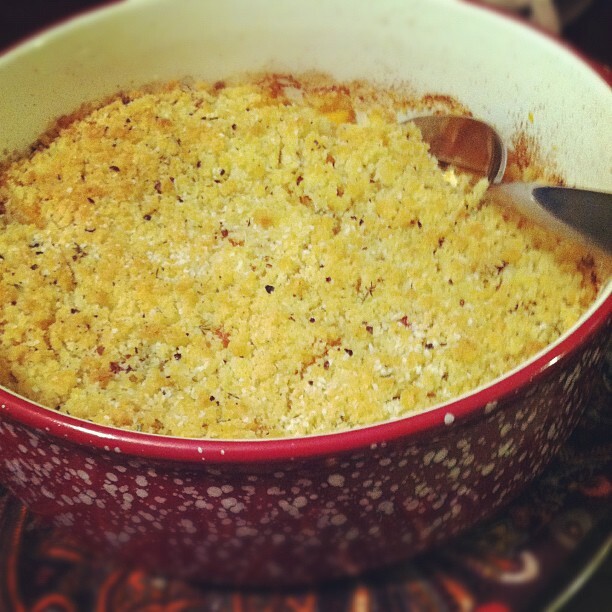 (Recipe for Butternut Squash Gratin at the bottom of this post). 1. 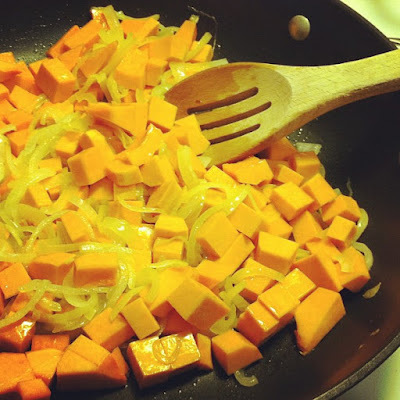 Prepare a sweet or savory dish that has an edible winter squash as the main flavor ingredient. 2. Share at least 1 photo of your completed dish(es) on your blog and include as much description about this dish as you'd like. You do not need to include an exact recipe--I will trust you on the ingredients--but recipes are always nice in case the readers would like to make it for themselves. 3. Creativity will help you stand out from the other entries! 4. The deadline for sharing your creation is Monday, October 31 at 11:59pm. This is my "host post," so link your submission in the comments section and I will visit your posts on Tuesday, November 1 to choose a winner. Check back here in a few days for the announcement! Preheat oven to 350 degrees F. Grease an 8 x 8 square baking dish or similar size round oven-safe casserole dish and set aside. In a heave skillet, heat oil over medium-high heat. Add onions and saute until light golden, about 8 minutes. Add squash, saute 5 minutes. Sprinkle 1/2 tsp each salt & pepper over mixture and stir. Place bread, rosemary, thyme, and a pinch of each salt & pepper in a food processor. Pulse until bread is in small crumbs. Set aside. Spread vegetable mixture in baking dish. Pour in chicken broth and cover tightly with foil. Bake for 40 minutes. Then remove dish from oven and increase oven heat to 400 degrees F. Remove foil and spread bread crumb mixture over squash. Drizzle bread crumbs with olive oil. Return to oven uncovered and bake for 25-30 minutes, until bread crumbs are light brown and crispy and mixture is slightly bubbling at the edges. I had my high school reunion this past weekend. It started a bit awkwardly with hugs outside of the high school football stadium. I found myself feeling a little anxious--the same way I used to feel when I was going on a first date. When I hugged a former classmate hello and smelled beer on his breath, I honestly thought to myself, "Maybe I should have had a drink before coming to this." After a couple of how-ya-beens and what-have-you-done-with-your-lifes, I realized I didn't need that drink. It turns out that ten years isn't that long to go between conversations with old friends. We laughed about trouble we used to get into, and the commiserated that we weren't such bad kids after all. Nearly everyone who attended already had one or two of their own kids (or maybe thinking about having some in the future) so we are starting to understand why we had early curfews, strict parents, and nosy teachers. They, the older and wiser generation, had a better idea of what was ahead of us than we could ever have imagined. I wish I could say thank you to them. If you're out there reading this: thank you. I also think I had a nice time because I'm in such a good place in my life. Married to a handsome, kind man, working a job I enjoy, helping to raise a daughter, and carrying out the vision for my "victory lap" year. I've lost a little weight. I've made some new friends. I'm focused on improving my overall health. I'm happy. How many people can say that about their lives? It may sound corny, but I'm certain my happiness has spilled over into the way I cook. I buy healthier foods and prepare them more thoughtfully. I research recipes more thoroughly but still feel follow my instinct in the kitchen. 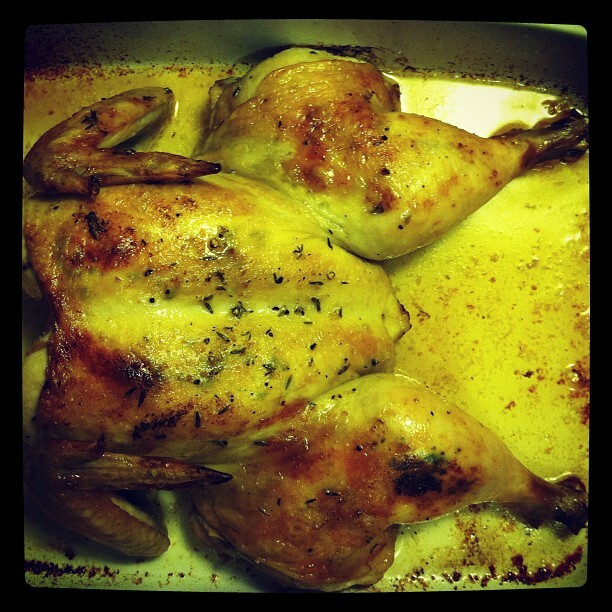 I don't say this often, but I've recently come upon the most perfect roast chicken recipe. So simple and delicious that a novice could master it with only a handful of ingredients and a hot oven. The chicken is juicy with incredible flavor and reheats in the oven for wonderful leftovers the next day. And if I had to recommend a must-have kitchen item for a home-cook, I would most emphatically say a meat thermometer. There is absolutely no way to tell if a bird or roast is cooked to the desired doneness without it. So go get one at once if you haven't got one already. And then make this roast chicken. A quick note before you get to the recipe: don't forget that Monday, October 31 is the day to submit your Culinary Smackdown: Battle Winter Squash entry. I will put up a "host post" here on my blog on Sunday with my own winter squash creations and you can link to your entry from there. In a pinch, I've found that a quick zap in the microwave at 10 second intervals will soften butter up. If you go too far in softening it, toss it in the freezer for a minute or two and it will quickly solidify. Also, an organic or natural, hormone-free chicken will always taste better than a conventional supermarket chicken. It's worth the extra investment. 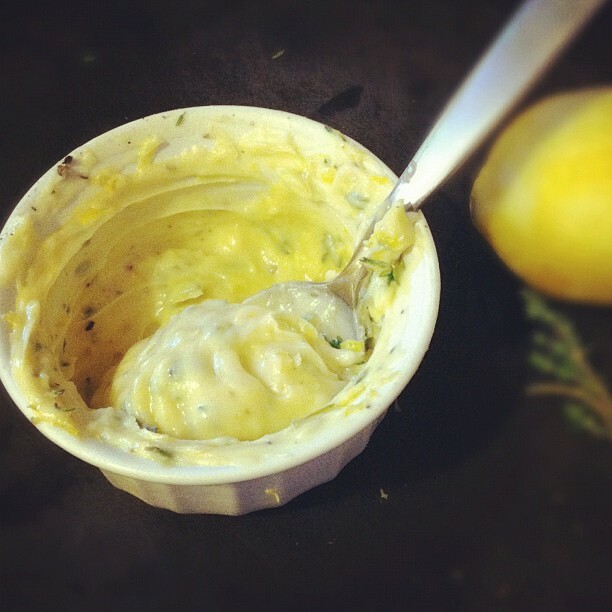 In a small bowl, combine softened butter, lemon zest, minced garlic, Dijon mustard, and a pinch of each salt & pepper. Set aside. Discard any neck or gizzards from the chicken. Pat dry with a paper towel. Set the chicken, breast down, on a cutting board. Using kitchen shears, start at the tail end of the bird cut along each side of the backbone to remove it. This should expose the inside of the chicken. Press it open slightly and sprinkle the cavity of the bird with salt and pepper. Flip the bird over so that it is breast side up. Press down between the breasts with your hands so that the bird lies flat. Trim away any excess fat and skin from around the cavity of the bird. Then gently slide your fingers under the skin of the breast and legs to loosen it from the meat. Smear 2/3 of the compound butter under the skin of the bird. Spread the leftover compound butter over the outside of the skin and then sprinkle the bird with salt & pepper. Lay the chicken in shallow roasting pan, such as a 9 x 13 casserole dish, and put it in the refrigerator uncovered for 1 to 2 hours. When you're ready to roast the bird, heat the oven to 425 degrees F and remove the chicken from the refrigerator. Roast the chicken at 425 degrees F for 20 minutes, then baste with the accumulated juices in the pan, and reduce heat to 375 degrees F. Roast for another 15 to 30 minutes, basting at least once more during the cooking time, until the thermometer when inserted into the thickest part of the breast reads 165 degrees F. Remove from oven and allow to rest, tented with foil, for at least 10 minutes before carving. Tonight I'm sitting next to the one I love, sipping a glass of wine; there is chicken roasting in the oven and radishes braising on the stovetop. You might say I'm having the best night ever. That's why I think it is a good night to bring you some of my favorite links from around the web. Since I am feeling so happy and loved, I think that all of these posts will make you feel a little warm and fuzzy, too. Think of like a Cheers! from me to you. I ordered some beautiful prints last week from etsy seller, Graphic Anthology. Trust me, you'll want to order everything she offers. Did you see the two little girls on the Ellen show who sing Nicki Minaj's Super Bass? If you missed it, I've got the link over here on my Pinterest board. There's a guy named Charlie Puth who videotapes himself singing and performing on YouTube. This video of him singing a duet of Adele's Someone Like You will tug at your heart strings. I know my list is a little heavy on the video links, but you can not miss this video of Simone Cowell on Late Night with Jimmy Fallon. Let's just say they do a little skit called Other Voices. We laughed hysterically. I want to send you over to my friend Sharon's blog. She recently wrote a post about her love for all things French that just made me want to have dinner with her again really soon! 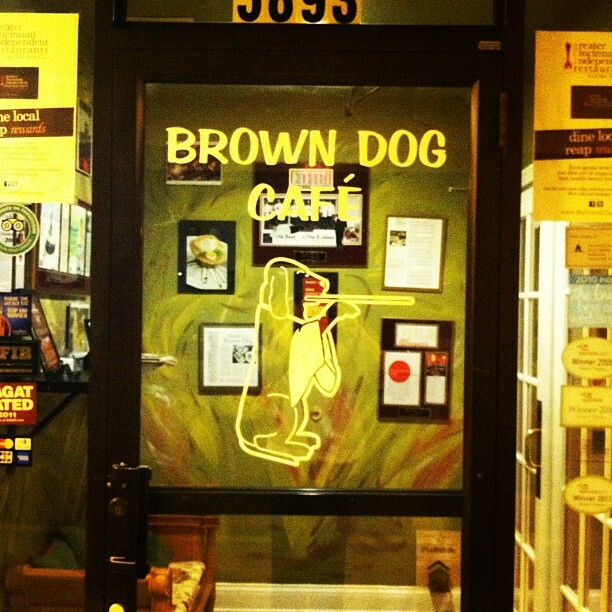 Oh, and if you want to be in-the-know about the Cincinnati food scene, she's a great person to follow. Monica Bhide is one of my favorite food writers, and I loved her recent story for Gilt Taste about fasting--or not fasting--to show her love for her husband. It made me want to cook a feast for my husband. 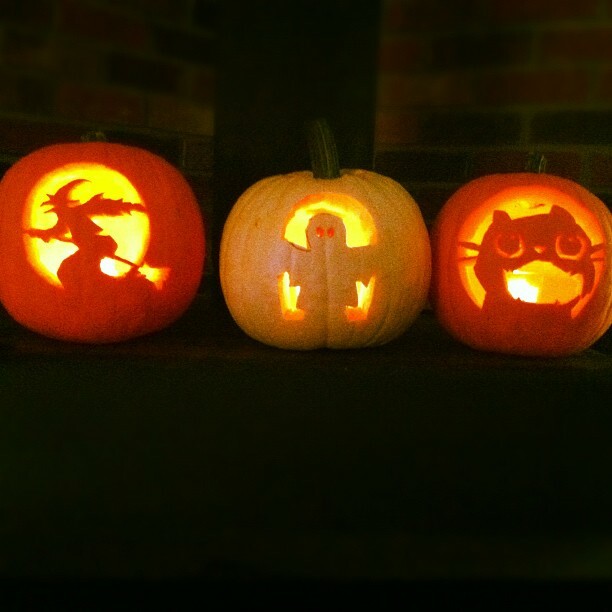 See you back here in a few days--I've got some jack-o-lanterns I want to show off and some pumpkin recipes to share. Have you ever watched a cold front blow in? The back of our house faces west and I can see the dark clouds creeping closer, dragged by chilly winds, from the window over the kitchen sink. It's an incredible view when the front is bringing with it a thunderstorm; lightening lights up our entire kitchen and west-facing bedrooms. I equally enjoyed watching today's gray, blustery cold front work its way our direction, pulling leaves off trees in the back yard with big mighty gusts. It just feels like fall around here. I kind of like it. I'm sure you're tired of reading about *pumpkin recipes, so I have something else in mind for today's post: chicken stock. It's the backbone for so many wonderful recipes. Shouldn't it get some attention, too? 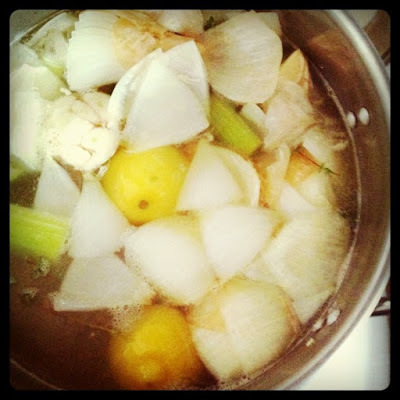 I don't necessarily think that making your own stock is a requirement for great cooking, but there are many reasons why it is important to me. First, and honestly foremost, is that commercially produced stock is often hard on my stomach. I'm sure it has to do with the preservatives required to make the stock shelf stable, whether it be in a can, box, or even a powder base. I just don't feel good after I eat it, and that's reason enough for me to make my own. There's also flavor to consider. If you're not convinced that homemade stock tastes better, I suggest a little (un)scientific study. One of my favorite podcasts, Spilled Milk, hosted their own chicken stock taste test. You can listen to the podcast straight from their website or by downloading it for free from I-tunes. Spoiler alert: Molly and Matthew concluded that while there are some decent store-bought options, homemade chicken stock was the winner. Now, I know there is some confusion about stock vs. broth. What's the difference? Are they interchangeable? How do I know what to make? The answer to all of these questions is the same--there does not appear to be a single source with an end-all-be-all answer to this question. The general consensus seems to be: when in doubt, choose stock over broth. Stock is generally made from the bones of chicken which gives the liquid a thick, juicy quality that you cannot get from only the chicken flesh. Also, a well-made stock that is allowed to cool to room temperature may have a slightly gelled quality. While this may be off-putting at first (it was for me), the gelling means that your stock is packed full of nutrients that are holding the liquid in this form. It means it's good for you. And the most fundamental reason for making my own stock is because I believe it's the omnivore's duty to consumer the entire animal. While this is a much bigger discussion than I'm going to enter in today, I think the best way to thank that animal for feeding you is to purchase poultry that is humanely raised and make excellent, high quality foods with every part of it. We generally buy whole chickens, and if we buy pieces it is always on the bone, and after we cook the meat I save the bones in a zip lock bag in the freezer, labeled with the contents and the date. You could make stock with whole, raw chickens, but I have never found that my stock is lacking from not being simmered with meat. It may take a little trial and error. Before you start, you'll want to decide if you to keep it simple or add additional ingredients. You can go either way--bones+water only or bones+water+vegetables+herbs+seasonings. I prefer the latter; I've never found that adding more flavor to my stock detracted from using the stock in future dishes. In fact, it likely saves me from having to adjust the seasoning when I use it in recipes. You'll thank me when a cold front blows your direction that you have this stock ready to go. It makes chicken noodle soup a cinch to throw together and it's a great base for any other soup or sauce you crave to warm you up this fall. 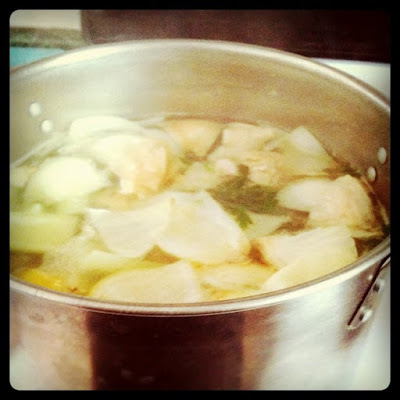 So here is where I try to tell you a great method for making stock. I'll do my best, but feel free to consult other sources for great ideas in stock-making as well. Start with a large pot. When it comes to choosing a great stock pot, depth is more important than width, so use one that is 16 inches or so deep. To the pot, add enough bones (previously cooked or raw/uncooked) to equal as about as many bones as you would have from two 4 lb chickens. This may be a variety of bones from an entire roasted chicken carcass, the unused backbone from a spatchcocked bird, or leftover cut up chicken pieces (like wings, which are often unused in recipes). Also add to the pot two unpeeled, halved yellow onions, two or three celery stalks, torn in half to fit in the pot, two or three whole carrots, scrubbed well and either peeled or unpeeled, a whole head of unpeeled garlic sliced in half horizontally, a halved lemon, a small palmful of peppercorns, a few sprigs of fresh thyme, and a small bunch of fresh parsley. Fill the pot with enough tap water to cover the ingredients by three or four inches. Set on the stove over medium-high heat and bring to a boil. Reduce heat to low and simmer uncovered, only checking every half hour or so to skim off any gray or cloudy foam that may rise to the surface of the water. Let your stock simmer on low heat until it reduces by 1/3. This may take 4-6 hours. Occasionally taste your stock, checking for richness and flavor--you are looking for a distinctly chicken-y flavor--and near the end of cooking I stir in 2 or 3 tablespoons of kosher salt. You can omit the salt if you'd rather add salt when you use the stock later. Remove from heat, let cool for 20 or 30 minutes. Pour stock through a mesh strainer into a large bowl or pitcher. Allow to cool down to room temperature. Stock can be stored in a variety of ways. Store large quantities of stock (which I prefer) by dividing into pint-size or quart-size freezeable plastic containers or sturdy zip-lock bags. Freeze. Or pour stock into ice cube trays for smaller portions. When frozen solid, put all stock-cubes into quart-size ziplock bags. 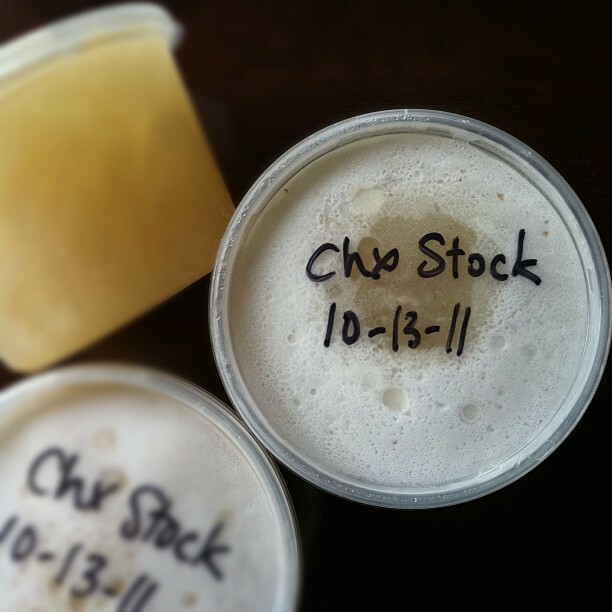 Always label your stock and include the date. Get into the habit of using the oldest stock first. It is not true that once frozen, food is good forever. While it breaks down much more slowly than if it were just in the refrigerator or at room temperature, even frozen food will start to lose its flavor and nutrients if left uneaten too long. *Don't forget--Battle Winter Squash will be hosted here on October 31! Please join us! It seems that vegetable gardening has come mostly to a close for me. We got so much cold rain during the month of September that most of our heirloom tomatoes split open on the vine, suddenly more vulnerable to bacteria and insects. 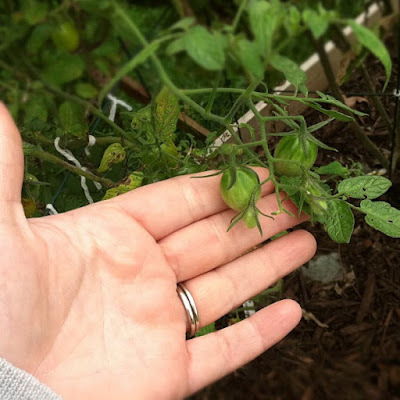 An odd thing happened simultaneously--a surge of new growth on the broccoli, red cabbage, and grape tomatoes has resulted in a last ditch effort to make something happen. I don't want to scare them off--because I'm thankful for everything they've given me this summer--but someone needs to tell them when to call it quits. 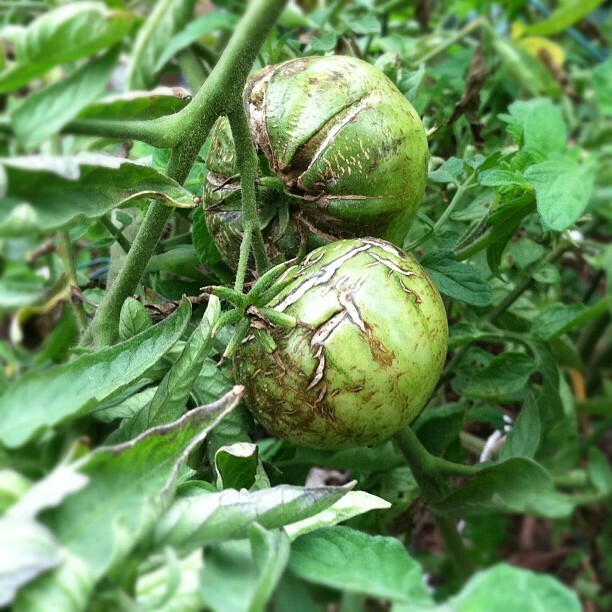 There isn't enough time for the delicate little tomatoes to grow and ripen. Frost seems to always be hiding just behind the next weather front so I'm not counting on anything to harvest. Fortunately the broccoli and cabbage are better suited for the weather and might keep growing for a while. 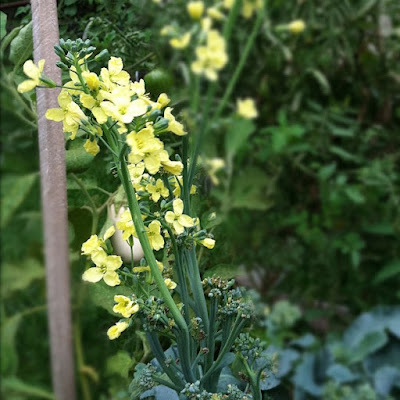 In a moment where I was looking the other direction, the central stalk of our broccoli plant shot up and flowered--just like that. From the window, I noticed the beautiful yellow blossoms. Immediately I put down whatever I was doing and wandered outside to look. Never would I have known that a broccoli was such a beautiful plant. These are things you just can't learn from shopping at the grocery. It's kind of amazing, isn't it? Things living and changing in your own back yard? That's gardening, for ya. A few weeks ago, I got an email from a blogging acquaintance, Sharon from Eggplant To Go, asking me if I'd like to join her for dinner. Cincinnati's Restaurant Week was coming up, and she had reservations that she had made with a friend who was no longer able to go. Not wanting to miss out on a chance to try a new restaurant, Sharon wondered if I'd like to join her. Let me just say that I am so thankful that Sharon reached out to me. I have always considered Sharon to be such an interesting writer on her blog, always uncovering new food trends in Cincinnati, and she shares my love for Top Chef. And as an adult, it's harder than I ever expected to make new friends. I'm not from Cincinnati so I don't have a built in group of friends here. I love my husband dearly, but he understands that I like to be busy and social. I was involved in a Ladies Wine group, but most of the members moved away so it sort of fizzled out. Sharon reached out to me on the perfect day with the perfect invitation--dinner at Brown Dog Cafe. I had never eaten here before so I arrived a little early. I was surprised that the restaurant is located in a small strip mall type location at the Pfeiffer Road exit off Interstate 71. The inside of the restaurant has a sort of upscale lounge feel with a nice wooden bar where I could see myself coming back and sitting on a stool for a glass of wine. There was a mix of booths and tables, and we were seated just around the corner in a little section of tables. It was cozy and comfortable; I found the atmosphere appropriate for a date, dinner with the in-laws, and even a business dinner. When Sharon arrived I immediately stood up to give her a hug. I instantly knew it was going to be a very nice dinner. She allowed me to choose the wine for dinner, and I found that the wine list was well rounded with a nice selection of glass pours and bottles at varying prices and types. Our server brought us the restaurant week menu, which included the option of choosing an appetizer, salad, and entree. All of the choices were interesting and sounded delicious. I started out with a Sea Dog for my appetizer. It was a seafood sausage served on a bun with a spicy sauce, sort of a play on a lobster roll. It was incredibly good, and I inquired of our server where the sea dog was sourced from. She confirmed Sharon's suspicion that it was from Lobsta Bakes of Maine. I know my husband would love this, and I want to buy some of these directly from Lobsta Bakes sometime soon. My second course was a pickled beet salad with goat cheese. The beets were sweet and vinegary and a perfect pairing with the creamy goat cheese. 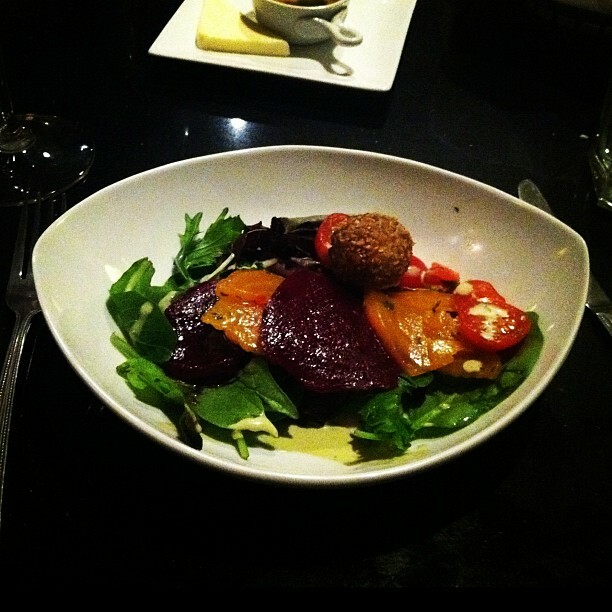 Beets are such an under-appreciated root vegetable, aren't they? For my entree I had a duo of incredible lamb chops that had a crispy, salty crust. They were served over cripsy potato wedges and asparagus. 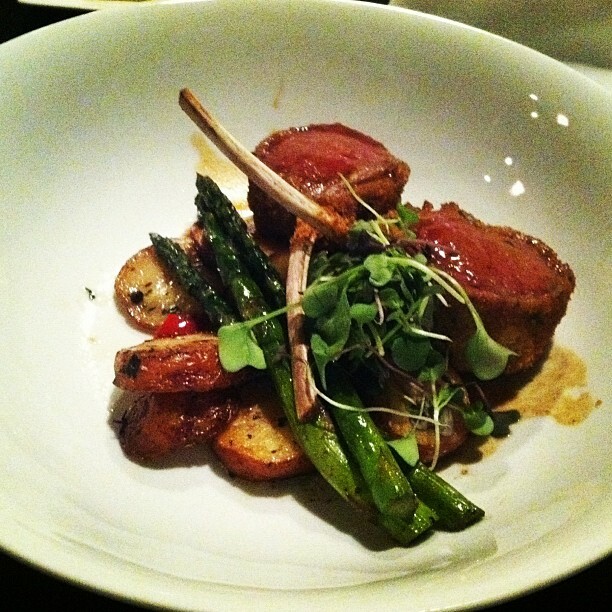 The chops weren't heavy or game-y but light and juicy. And seriously awesome. I would order this again and again. Overall dinner was fantastic. We polished off a bottle of wine and talked about everything under the sun. Sharon is one of those people that I think I could always find something to talk about with, and I really appreciate that in a dining partner. I hope to see you again soon, Sharon! 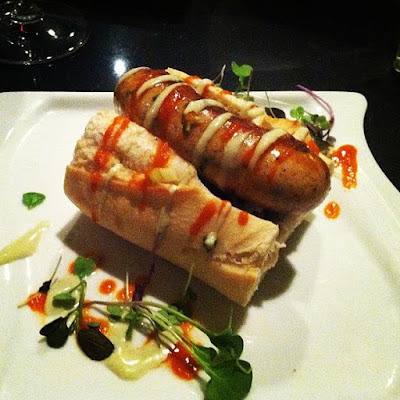 Oh yes, you are now reading the blog of the reigning Culinary Smackdown champion! I won Battle Oktoberfest with my Warm German Potato Salad (thanks Mom!) and that means I not only get glory but I get to host and judge the Culinary Smackdown for October! Over the weekend I mulled over a few ideas for the theme for October's competition. I considered Battle Scary Food, but that seemed too broad and subjective. I also considered Battle Pumpkin, but a friend pointed out there may or may not be a canned pumpkin shortage this year, making that theme challenging. So I finally settled on a pumpkin-related theme with a slightly broader, more accessible theme. 4. The deadline for sharing your creation is Monday, October 31 at 11:59pm. I will put up a "host post" here on my blog and on October 31, you will need to come and comment on that blog post with a link to your blog post that contains your Battle Winter Squash entry. I will choose a winner on Tuesday, November 1! Want to make something with pumpkin from scratch? Follow this link to a tutorial on homemade pumpkin puree from Annie's Eats. Good luck! I'll be posting some of my own winter squash recipes here and am looking forward to judging the entries at the end of the month! Hi, I'm Jen. Thank you for stopping by. 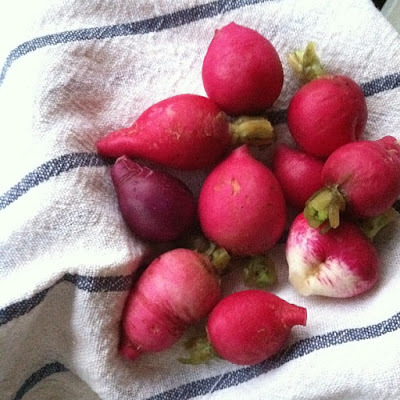 I write about cooking, vegetable gardening, and life with my family. Want to know more? Check out my About page.